Great Last Day of School Activity! Spelling practice can be fun! Help your students review and improve spelling and writing. 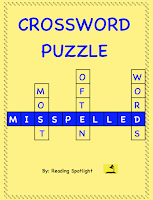 This Most Often Misspelled Words Crossword Puzzle includes 90 words that are commonly misspelled and an Answer Key for easy checking. Find it in the Reading Spotlight TpT Store.